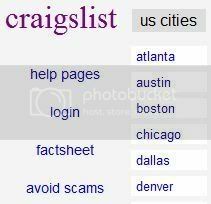 Actually met someone the other day who'd never heard of Craigslist. And here I thought it was as ubiquitous as Ebay and Amazon. Ah, well. In case you're the OTHER person who's never heard of it, Craigslist is this decade's new Pennysaver, the new Classified Ads, the new Yellow Pages. Come join the rest of us who are using Craigslist to buy and sell our tchotchkes, find employment, advertise garage sales, hire a guy to fix the roof, and moan anonymously over lost love. See what you're missing? What websites are you shocked that people don't know about? Tell me about 'em by clicking that Comments link below.